Howdie sweethearts. How about that Mr. Songbird, confiscating my blog and then asking me all weekend if someone responded to his post. Well I am back in the saddle with the reigns tightly in my control. So after yesterday’s macho post I thought I’d up the girly factor in this blog today. I am here to show you my Fall Wreath. Actually it is based on last years Fall wreath. It was nice and romantic and I loved it so much that when I was done using it I just couldn’t make myself disassemble it. Instead I opted for the much better choice of hanging it somewhere outside and pretty much forget about it there. Fall colors all right. 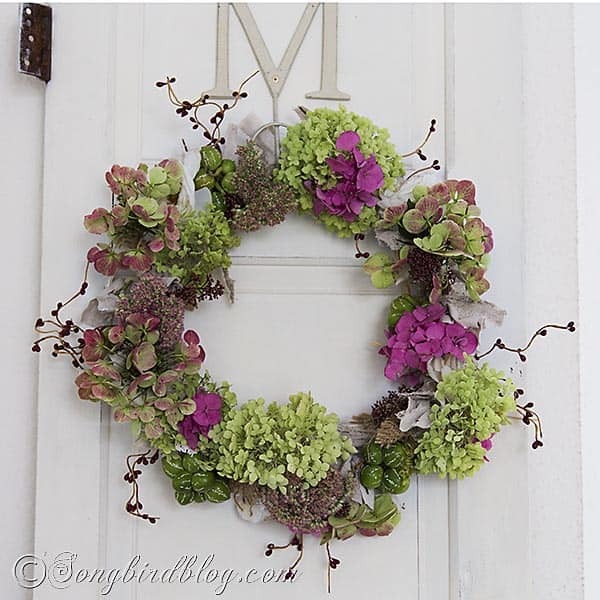 I was about to take it apart until I saw this beauty of a wreath on Vibeke Design. It totally inspired me to give my Fall wreath 2013 a makeover into 2014. And here she is. Fresh hydrangeas from my garden (three varieties), some sedum, skimmia berries and some green African mini pumpkins (Diplocyclos palmatus) that I found at a pumpkin farm. I wiggled and stuffed everything in between the rag base, fiddled with it until the arrangement was balanced and called it a day. Another corner of my home Fallified.